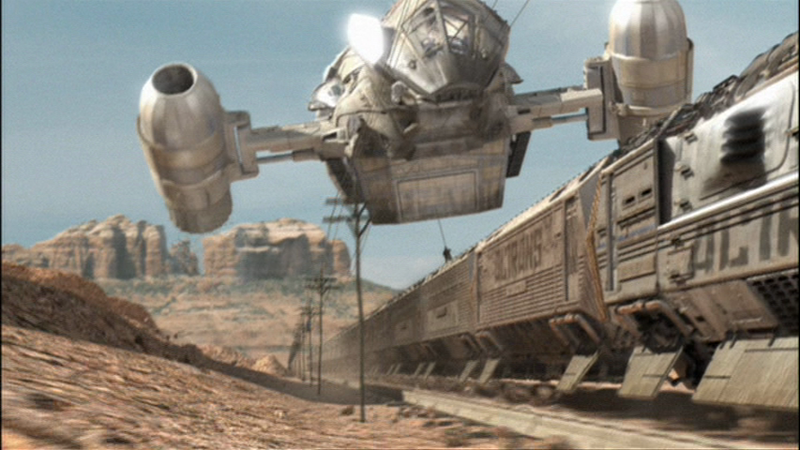 The crew of the Serenity, in economic distress, takes a job from a cruel gent named Adlai Niska to rob a train. Mal doesn't ask the particulars, which Niska appreciates. However, when Mal and Zoe board the train posing as regular passengers, they discover their first wrinkle: Alliance guards. Mal is thrilled at the notion of stealing something from under the Alliance's nose; Zoe's a bit more worried. Regardless, they successfully pull off the heist. Before they leave the planet, however, they learn that what they stole are medical supplies that are desperately needed by struggling colonists on this world. After Inara helps liberate Mal and Zoe from custody, all the robbed train's passengers are being held, Mal decides (over Jayne's objections) to give back the supplies to those who need them. - It is not clear why Book is still on the ship, given that he boarded with the intent of getting off after the detour to Whitefall. In the pilot, Inara says to him "maybe you're exactly where you ought to be," after he expressed concern over falling in with criminals. This could signal that Book had decided to stay aboard. However unlike Simon who was allowed to stay because of his talents, what Book had to offer the crew was already given in the pilot with his payment for transport. It is possible that Mal let Book stay simply because Book wanted to stay; I'm sure Mal could use the extra help for odd jobs, at least those Book would find ethical, but a scene explicitly explaining why Book was allowed to stay aboard permanently would have been appreciated. - This episode establishes that the Serenity is not equipped with any weapons. - Firefly class vessels are mid bulk transports equipped with a standard radeon accelerator core. Class code 03-K64. - Companions choose their own clients according to guild law. - Inara has been on the ship for eight months. - Mal provoking a fight with the pro Alliance people. - Jayne: "Hey, I didn't fight in no war. Best of luck though." - River: "Mal. Bad. In Latin." - Mal: "Kaylee, what the hell was going on in the engine room? Were there monkeys? Some terrifying space monkeys maybe got loose?" - The sight of the space station. - The execution of the train job itself. - Jayne collapsing from having been doped by Simon. - Mal impaled with Nishka's goon's blade. - Mal offering one of Nishka's goons his money back, he refuses, so Mal kills him and offers another one of his goons the same deal who very quickly accepts. What we have here is a story of conflicted morals. Clearly Mal makes arbitrary decisions about what is and what isn't right which is an interesting character flaw for a leader that already know is deeply flawed in many ways but this episode and its moral dilemma leaves you wondering what you're supposed to take away from the supposed moral lesson presented in this story. I think Mal contradicts himself pretty hard in this episode. He's trying to play both sides of the honorable thief coin. Some honorable thieves believe that their honor to their clients comes before everything else. Mal is clearly sitting in this zone at the beginning of the episode. And some honorable thieves believe that stealing is only right when those who are stolen from do not significantly suffer as a result. This axiom is evident the story of Robin Hood with the catchy phrase "steal from the rich and give to the poor." Mal clearly swings over to this side by the end of the episode. In the end there's something unappealing about how Mal accepts the job then breaks his word after discovering the cruel details of the work. Either you respect your client's privacy about what is being stolen and do the job no matter what, or you don't and you ask prior to taking the job. This in between crap is not in my opinion acceptable. Mal says to Nishka's goon "we're not thieves. But we are thieves. The point is we're not taking what's his." This most certainly an ineloquent way of stating his principles which lead me to believe he really doesn't understand himself just what his principles are. And if there's anything to be certainly retained from this episode it's this. The episode does however have a lot going for it especially spectacle value department. The special effects shots of the space station and the train job itself were extremely well done and the humor in this episode is even more effective than in the pilot. Beyond raw spectacle and amusing humor, however, the episode fails to make a point and comes off as average at best. I always thought it was pretty clear as to why Book was still on board - he's a paying passenger, just like Inara. That explanation could work but it is a bit of a stretch. In the pilot, Book says he has "a little" money with which to pay his short term fare. Surely that did not cover his entire stay aboard ship? One can postulate that Book considers himself "in bed" with the crew of Serenity now that he has aided them in assaulting a lawman and witnessing his murder. He's also more or less in his element given what we can begin to glean from his past at this point. Mal's motivation for keeping him on board is a tad fuzzy and is a bit harder to guess at. I like to think that Mal is amused at the idea of having a man of god on the ship if only to antagonize him. He also might think that Book is a voice of reason and provides sound advice as well as input. Unfortunately, these are just assumptions on my part and I would have liked a scene devoted to the finalization of their agreement. But yeah it never really occured to me until you brought it up. Book may be allowed to remain on board b/c it's been shown that he's something of a good cook. I know this is a pet peeve of yours so I thought I would mention it. In the opening credits, when Book introduces the show, he uses the term "solar system". Soon as I heard it I remembered some of your postings. As far as I can remember, I don't remember a show that regularly uses a different term to describe a different star and planet system. And, as far as I remember every show I have ever seen uses the term "solar system". It also occurs to me that words get their meeting from usage. Everybody knows what is meant by "a different solar system" but some people I know might not gather the intended meaning by the term "planetary system" or other some such. I get what you are trying to say but at some point don't you have to just give in? You're not going to get that whale Ahab.